trueHybrid™ technology - bringing the power of CPU and GPU together! finalRender for 3ds Max is the perfect choice for 3d artists and studios alike wanting the maximum in image quality and photo-realism, without experiencing a brain melt when setting up complex scenes for rendering! And no compromises. For full information on the Drop 3 update, look under the Updates tab. finalRender is like a photographer’s dream come true. Creating light in the picture as a collection of electromagnetic waves, and a true unbiased renderer without compromise, finalRender trueHybrid™ achieves delicate realism with image and color generation based on real-world physics. finalRender is the new breed of light simulation software offering unique algorithms and approaches to light simulation not found in any other renderer for 3ds Max. trueHybrid means that it does no longer matter if you create photo real images on a CPU, on a GPU or both at the same time. finalToon 4.0 is available as an integral part of finalRender or as a standalone product. finalToon 4.0 is included with a full subscription of finalRender. finalRender trueHybrid™ technology is about worry-free rendering. A few powerful and accurate settings is all you need to achieved amazing results. finalRender is unique in many ways, it uses a physically accurate wavelength based light distribution model. Unbiased path-tracing means, the rendering results are always accurate and realistic. Setup any scene like you would in the real world; place some objects and lights and let finalRender simulate a real world camera. Pointing its virtual camera and releasing the shutter is all that is needed: Photo taken! Light is part of the electromagnetic spectrum, which ranges from radio waves to gamma rays. Visible light is nothing else than electromagnetic frequencies the human eye can actually see or detect. Now, using real world physics and Monte Carlo sampling to simulate light energy transport within a 3D scene opens up new possibilities to render images. Spectral waveform simulation recreates optical effects on materials which are impossible for older generation raytracing systems. Only Spectral-based Rendering, the way it is used in finalRender, is able to simulate effects such as Diffraction, Dispersion, Absorption, Iridescence and Interference. All of those mentioned optical effects can only be truly recreated with Spectral-based Light Simulation methods. finalRender Subscription Drop 3 now comes with a CPU based Denoising technology. In addition to the latest NVIDIA RTX Denoising option, finalrender also offers Intel's Open Image Denoiser a CPU based AI -Denoiser. No other rendering system for 3ds Max offers you the choice of trueHybrid™. finalRender is the first renderer of its kind for 3ds Max to offer a comprehensive, true Hollywood quality rendering engine that supports GPU rendering or pure CPU, as well as both technologies at the same time. finalRender's trueHybrid™’ technology allows the user to experience all the power within ONE application. No need for a separate GPU only product! finalRender offers an optional unlimited network rendering license which is the cost of ONE single workstation license, only. What more affordable solution can you find for a top line renderer? Tap into the power of unlimited network rendering and get peace of mind guaranteed. finalRender supports 360 Panoramic image output and various video VR formats including 3D Stereoscopic VR output. 360 Panoramas, for example, can be created with one click of a button and they are ready to be published on Facebook. Best of all, it works right out of 3ds Max. finalRender supports all of the standard lights in 3ds Max, and it comes with its very own highly optimized and fully multi-threaded IES light. This native area light is highly configurable and is meant to replace all light types you will ever need. Setting up lights and changing light setups becomes as simple as clicking a button on your mouse. There is no argument that having a good scene convertor is important. Modern 3D assets come in many formats. finalRender directly renders many mental ray scenes and it offers a robust scene conversion from scenes created with vray or mental ray. finalRender comes with many dedicated materials and supports the thousands of preset Autodesk materials in addition to the mental ray materials. However, to deliver the best possible result with the utmost control, finalRender offers a dedicated carpaint material. It features metallic flakes, special coating and reflection layer. 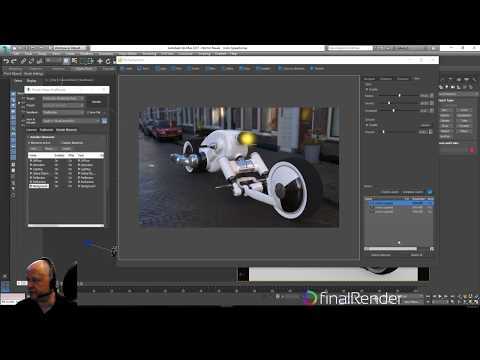 finalRender is all about physically accurate rendering, and thanks to its unbiased rendering approach, it reproduces real world camera effects like no other renderer. Time consuming rendering effects like Depth of Field or Motion Blur no longer multiply render time - all is calculated in one go! 3ds Max physical camera model is fully supported in creating such effects. Thin film is a real world effect driven by light interference. Different wavelengths of light create specific colored interference patterns for different film thicknesses. Such real world phenomena can only be simulated by a physically accurate spectral wavelength renderer like finalRender. The delicate intricacy of real life effects can only be captured by such effects. The new finalRender frame-buffer offers real-time exposure control while rendering an image, an unlimited easy-to-access render history; to mention only a few of the advantages. The simple and responsive user-interface gives access to all of the main features and lets you choose which images or animations to save at any time within your creative process. Amazing flexibility. Many users expect proper instancing support from a modern renderer. finalRender offers full support of Forest Pack Pro instancing along with several of its materials and tricks. It is one of the few GPU capable renderers to support advanced instance rendering including proper material and texture handling. Render Elements in finalRender can be accessed anytime in the new frame-buffer through a simple-and-easy to understand tree view system. Render Elements are automatically grouped by Image/Frame Number. Render Elements can be compared in a simple frame-by-frame manner right from within the same frame-buffer display. finalRender is unique in many ways, try it and you will know. finalRender will serve to debunk the myth that unbiased rendering needing countless random rays like natural light, results in speed lost and noise. Not anymore, Cebas developers have resolved both the speed and the 'noise' issue giving photo realistic accuracy - Drop 1 uses a unique Adaptive Sampling to interpret and recalculate pixels in a complex "feedback loop" - while staying faithful to unbiased rendering and physics accuracy. Texture baking (Render to Texture) is now incorporated as well. finalRender, using Spectral Wavelength in real world physics and Monte Carlo sampling simulates light energy transport within a 3D scene that recreates optical effects on materials which are impossible for older generation raytracing systems. Only Spectral-based Rendering, the way it is used in finalRender, is able to simulate effects such as Diffraction, Dispersion, Absorption, Iridescence and Interference. Adaptive Sampling in fR-Drop1 introduces adaptive sampling while still keeping true to its fully unbiased rendering paradigm. Adaptive sampling in finalRender is achieved by reducing the amount of pixels it processes in any given pass. Artificial Intelligence in the form of a neuronal network drives the latest denoiser functionality of finalRender. This latest advancement in rendering technology allows to cut render times easily in half or even more be removing noise form the image. You see the final results instantly! Texture baking trueHybrid™ technology is now fully available for texture baking (Render To Texture) in 3ds Max. Use either CPU, GPU or both at the same time to bake out your textures and lighting information. Render To texture, deeply integrated in 3ds Max, is now fully supported. This is not a GPU-only approach, but the finalRender even on CPU behaves like a GPU renderer with added power, all the latest materials, and flexibility made available. A significant difference if you were to compare renderers. finalRender = only trueHybrid in the market today. finalRender is about a balance of speed plus the additional flexibility working with your render elements; yes, there might be some other renderers that will give faster speed, fR development is towards quality and flexibility for the users. That’s all you need to learn : the few buttons on fR, and concentrate on the aesthetic presentation of your images instead of mind-boggling UI. It’s about achieving greater art-direction vs. technological tweaking. You can concentrate on the more important lights, shadow, materials … scene setups. And just press Render. 3ds Max gives a few render elements on screen which are complicated – fR has a button to refrain from these confusing popup windows…formerly, these render elements are dumped into your hard drive taking up space but with fR, you get all the layers and data elements individually displayed to work on. You can save every stage of rendering that you have tweaked. finalRender FrameBuffer allows you to close off the dumping and provides a well-organized tree-sorting of the elements (see menu item : enable TreeMapping) and, – there is a saved History of your renderings. Artists can develop the rendering real time right in the finalRender screen and there is less hassle to go back and forth on Photoshop; especially useful to those that do not have the Photoshop pipeline. You can adjust all the combos: from Temperature / Tint / Exposure / Contrast / Highlights / Midtones / Shadows / Black / White / Vibrance / Saturation / Vignetting / Hot Pixel … just on this one ‘fR- FrameBuffer’ button alone; Reset-able as well for modifications while rendering on real-time. Right in 3d Studio Max, in fR- Frame Buffer: you can select : fR-Diffuse/ fR-Speculars/ fR-Lighting / fR-GI/ fR-Reflection / fR-Refraction / fR-Background : a huge deal of control on your side. It’s control and it is flex power! introducing the new fnalRender’s new FrameBuffer for Render Elements – raw image adjustment with no need for Photoshop so you don’t have to have another PS pipeline, real time feedback. Try fR-Lighting element and adjust the De-Noiser; Edwin demos the same using fR- GI. The good thing is that these two example render elements are only part of the composition and you therefore have the flexibility to create in-depth image/model changes. As promised, the detail adjustments is non-destructive to your original. Enabling the Compose Layers will then bring your detail adjustment of the render elements making a new image that can be saved; in other words, you need not switch to a Photoshop layers to see how things stack up and the final result – you get it right in the 3dsMax and fR-FrameBuffer on your work screen. And whatever you see in the FrameBuffer, you can now Save it. FR is fully integrated in 3ds Max and you can work on everything in Max. With this major release, finalRender is at the cusp of new rendering technology towards an even more powerful version in the Updates to come, highlighting a high degree of non-destructive editing. Interactive Rendering: Active Shade in VFB or Scene! - Dispersion, Interference and Thin-Film! - Real Time Controls while rendering - flexibility for you. - Works even with Massive Scenes! - ...Lights, Materials and Cameras... All convertible! - You can mix and blend Materials, work with Layered Materials on GPU with fR Scene Converter: trueHybrid (TM) technology works on all large scale renderings! - Optimal Forest Pack Pro Support CPU and GPU - Active Shade, Volumetric Effects and more..
- Dedicated GI-Aware Volumetric Effect! - Again Full CPU & GPU !! finalRender is fully optimized for photo-realistic rendering on the latest Intel® processors with support for SSE4, AVX, AVX2, AVX512 . finalRender supports runtime code selection to choose the best possible algorithms matching the instruction set of your CPU. Due to the fact that finalRender is a high performance 64-Bit movie quality renderer, a latest 64-Bit Operating System and Intel compatible processors will be required to successfully operate finalRender. Drop3 comes with native support for NVIDIA's RTX Turing GPUs. finalRender offers RTX denoising by fully leveraging Nvidia's tensor core technology to achieve lightning-fast denoising on GPU. With the introduction of this brand new CPU based AI denoiser, finalRender delivers again, a 100% feature equivalent trueHybrid mode. finalRender Drop3 now offers Intel's latest AI denoising technology which is purely based on CPU. No other rendering solution for 3ds Max delivers that much flexibility to the artist. video 3 the OptiX Denoiser (GPU) at work. Information stamp has a new parameter: ‘%ratio’ (percentage ratio) will print out the number of passes used by your CPU and your GPU. It is a great indicator of the efficiency of your CPU or GPU, and lets you decide if it actually makes sense to use your older or outdated CPU to help with rendering an image. 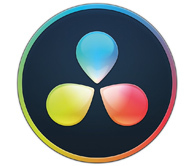 Drop 3, now saves the final image from its own frame buffer including all Exposure adjustments or filters (denoising). It is no longer necessary to manually save the modified frame buffer Image or sequence of images. Overall speedup on complex scenes or models. finalRender performs up to 10x faster now. Revolutionary biased light cache algorithm combines bias and unbiased techniques in a single light cache. This plus trueHybrid™ and you have top performing speed and image quality. finalRender for 3ds Max is the perfect choice for 3d artists and studios alike wanting the maximum in image quality and photo-realism, without experiencing a brain melt when setting up complex scenes for rendering! And no compromises. Hardware optimization in Drop 1.0 trueHybrid™ means it no longer matters whether you create photo-real images on a CPU, on a GPU or both at the same time. 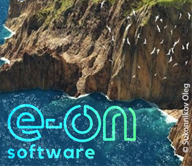 Software optimization now Drop 2.0 biasHybrid™ further reduces random noise through the use of Lightcache technology; render faster, with fewer passes and no compromise in quality or finer controls. View Features videos below. 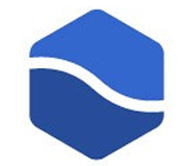 The Big Speedup - finalRender Subscription Drop 2 represents the biggest enhancement so far. A new biased Lightcache system, a general reduction in overall memory usage and new algorithms throughout, offers the best trueHybrid™ rendering experience yet. GPU kernel memory usage has been reduced by up to 50% on newer NVIDIA cards. True unbiased CPU and GPU processing time has been sped up by up to 25%. Now, considerable fewer passes are needed to achieve a cleaner result in less time. Depending on the individual scene setup rendering speedups of 2 times or more are not unusual to see with this new release of finalRender. Drop 2 SubSurface Scattering has also been enhanced dramatically. The new SSS now uses Random Walk methods to enhance the look and calculation quality of Subsurface Scattering. It is faster! Physically accurate and lets you control the absorption of light based on its individual depth-based Wavelength Spectrum filtering. SSS works much better now with cavities and thin protrusions on the surface. For the first time, a biased rendering method has been married with a true unbiased spectral based rendering technology! It is like achieving the task of squaring the circle. finalRender perfectly combines those contradictory rendering methods into one simple to use but powerful package. Drop 2 reduces GPU kernel memory usage by up to 50% on newer NVIDIA cards. True unbiased CPU and GPU processing time has been sped up by up to 25%. Considerable less passes are needed to achieve a cleaner result in less time. Active Shade is now more responsive. The new SSS now uses Random Walk methods to enhance the look and calculation quality of sub surface scattering. It is physically accurate and lets you control the absorption of light based on its individual spectral wave length . SSS performs much better, now! finalRender now fully supports the standard Autodesk Physical Material which makes it perfect for scenes created with previous versions of 3ds Max or scenes created for Arnold and ART. 3ds Max' own scene converter also offers to convert materials into the standard Physical material. 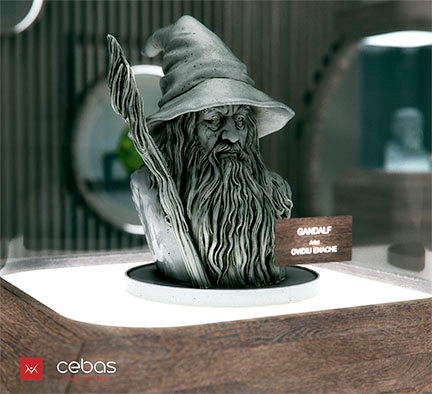 Edwin Braun from Cebas has started an ongoing tutorial series for finalRender trueHybrid. The 8 tutorials released so far touch on topics ranging from denoising and rendering best practices, to 360 panoramic views and image based lighting, and much more. 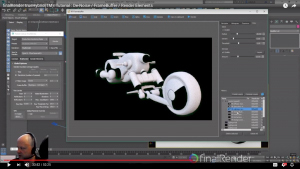 In this live stream recording, Edwin Braun talks about how to use Image Based Lighting to illuminate a scene in finalRender. And he explains the use of HDRI files and why some HDRI files are better than others, with reference to RGB colors, and more.